C is a white femme and a director, deviser, and museum educator. She is most interested in work that is subversive and surprising, intentional and brave. Her lens is intersectionally feminist. VT is a deviser that makes it a point to not see shows too often in the hopes that it won’t taint the joy and wonder they feel whenever they watch live performance. C: I knew basically nothing about this show coming in, which was really nice. It’s rare that I feel like I’m seeing something without a lot of assumptions. I was in a pretty relaxed and happy mood and also jazzed about the art downstairs at Asian Arts! VT: Agreed, I was in a very similar place. I had seen some programming at the Asian Arts Initiative, but I knew absolutely nothing about Zhang’s work. And honestly, that’s how it should be. I later learned that a bunch of Pig Iron alums/students had worked on it, but I never felt like that affected my perception of it in any way. C: I loved the set when we first stepped into the space. Coming into the show pretty blind as to its content/themes, the large white curtains and floating chairs and shadow elements immediately put me in a very dreamy place–I felt very primed for the kind of show it turned out to be. 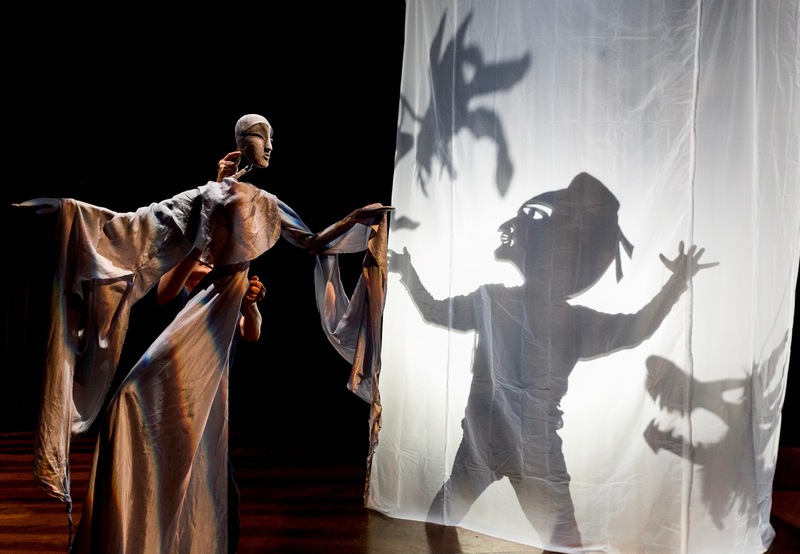 VT: I felt as though the design pretty much stole the show – which makes a lot of sense considering how much of the work was dependant on puppetry and shadow play, and it really demonstrates what happens when visual artists try to create live performance. The result was deliciously non-theatre, and it really transcended a lot of expectations I have in a setting like this. C: Oooh, yeah. “Deliciously non-theatre” is a great descriptor for this work. One thing that I appreciated throughout all of the design and performance elements was a really bold mixing of different elements. Just to pick one element, there were so, so many puppets and masks and many of them were made of different materials, manipulated differently. There were also a bunch of ordinary objects that were manipulated really successfully–I’m thinking especially of the clear drop-cloths that were used for water. VT: I really had to stop myself from screaming “yas!” in that moment. That big white orb in the first few minutes of the piece was especially interesting. Somehow, they managed to create some kind of human relationship with this inanimate object. And the collective audience response was a testament to how powerful the puppetry was. C: I think the sound (a combination of live and recorded music by Bhob Rainey) also worked really well in moments like that–the white orb–to get us all in a dream-like space. Occasionally the music seemed sort of dissonant with the action–I’m thinking specifically of when a performer entered the space and approached the drop-cloth water to wash her face. The music in that moment felt kind of suspenseful; it gave me a sense of dread. It was an interesting juxtaposition. VT: I think some of that dissonance goes hand-in-hand with the artists’ goals. Zhang really wanted to find a blend of Western and Eastern influences in her work, and I think the music was really a testament to that intention. C: There were a few costume pieces utilized outside of the really magnificent masks and puppets–I honestly could have done without some of them. I really appreciated the moments where the performers were just in black clothes, interacting with the puppets they were manipulating. That also really drove home the intention you mentioned above–this grounding in two different worlds. VT: I actually enjoyed a majority of the costumed beings we encountered. The shapeshifting paper dancer was really effective, and ESPECIALLY the puppet being controlled by that stretchy white fabric. C: I think when the costumes were consistent with the textures and materials that showed up in the puppets and masks, I found them very effective–there were a few times, though, that it seemed like performers had just added on some drapey pieces of fabric that didn’t necessarily have the same impact. VT: I have nothing but nice things to say about this piece, with the only exception being the way that I experienced the 360’ viewing angle. C: HARD agree. I think we can get into that a little bit more in directing, but I’m totally with you there. I think that since this piece is going to be performed again in a different space, a little bit more intentionality about the way the audience views the action is going to be important. I will say that once I abandoned my stool in favor of standing, crouching, and sitting on the floor to see what was going on, I immediately felt more connected to the piece. It felt like my participation became more free and playful. VT: I’ve always had wild dreams of making some kind of performance that utilizes this kind of viewing experience, only for a production manager to tell me: “Please don’t do that, that sounds like a terrible idea.” I think seeing this helped me identify some of the challenges of working in a space like that. VT: Travis Draper really owned the puppets that he controlled – from that stretchy fabric dinosaur (for lack of a better descriptor) to the olive-colored masked figures. He even used the performance as an opportunity to show off some interesting movement. C: Huge shout-out to all three of the performers manipulating the olive masked figures. There were many, many provocative images in that show and that trio has really been the one haunting me since last night. Also really loved the dinosaur/snake stretchy figures, and found myself really moved by what seemed to be a love story between a blue puppet and a masked figure. VT: YES! The blue puppet was the only time we saw Zhang perform in the show, and when she did, it pulled a vulnerability out of me that I’m not used to experiencing. This is probably the biggest superpower that her puppetry has (and great puppetry in general) – we feel far more empathy for these constructed characters than we do for live bodies on stage. VT: But some additional performances I felt were very strong included Jeanne Lyons, who juggled both stage business and puppetry in a way that never took me out of the world of the story. Chad Williams had a really great moment with that smaller blue puppet and the dragon-like costumed performer, and played a great sidekick to Travis Draper’s white fabric dinosaur. C: I Really loved Elizabeth Weinstein’s movement work. I found her really interesting both with and without a puppet, and in a show with SO much visual interest, I was really impressed to see the simplicity of just a body in space be so captivating. C: To continue our conversation from above, I think that a little more attention could be given to audience arrangement and visibility of the action. Having action all around the space was cool, but depending on where you were seated or standing in the crowd, certain things were very hard to see. There was a lot of action on the ground that I missed by being in the back of the crowd. VT: Even standing didn’t provide the best viewing point, and in order for me to be able to see the action onstage I had to be willing to be rude to another audience member and get in their way. I also felt like there were a lot of off-stage distractions that took us out of it all – loud noises, a member of the ensemble passing through in the corner, etc. A lot of heads were turning. C: Yeah, I think that was another thing that came out of having action and set all around the audience. There were times when movement out of the corner of my eye was drawing me to a piece of action and there were other times when I was being drawn to a light being moved. I would be really interested to see if there are ways for the audience and the action to be integrated a little more fluidly. One of the things Zhang talked about in her director’s notes was her desire to have the audience take an active role in interpreting the work, and I think that making the role of their participation a little more physically clear would really kick this piece up to the next level. VT: Definitely – and I’d be curious to see what kind of space they’re working with when the piece goes to Taiwan. To some extent they were limited by the configuration of that room – it’s a big empty space that’s hard to soundproof with just those white curtains alone. There’s a lot of acoustic challenges. C: Outside of sight-line challenges and some off-stage distractions, though, I really admired the variety of pace and tone we saw throughout the show. It got very meditative by turns and then at time quite funny or rolling. Those shifts felt very natural and not at all jarring to me, which is a credit to the direction and to the performers, too. VT: Totally, I think Zhang’s role as the lead artist demonstrated a clear vision that never felt confusing or unbalanced. I would agree that her biggest strength was in playing with the mood. It’s an arc that’s very difficult to capture in what seemed like a very ensemble-driven collaborative process. C: This piece felt timeless to me in that it left a lot up to the audience in terms of interpreting meaning. I think it probably affected different audience members in very different ways. Because of that, I didn’t think it spoke to this specific cultural moment, but that that wasn’t necessarily to its detriment. What did you think? VT: I would agree, but I would also be interested in learning how her audience outside of the West would respond. It seems like the content was generated here in the States, and there would probably be moments that would take on an entirely different meaning to a different audience. A moment that stood out to me was the shadow puppetry involving skylines. C: That was a really interesting moment, yeah. I think it was an example of the blending of Eastern and Western culture that the piece was interested in exploring. I also appreciated that, though the show featured white and non-white performers, the vision was driven forward so clearly and specifically by Zhang. VT: I definitely wanna hear how her show went while it was touring. C: Yeah! Super interested to see how it plays for other audiences.